Indonesian's herbs and spices add to the rich nature traditional experience of our treatments to totally relaxation. This selection of treatment is available featuring aromatic of natural oil and an exotic blend of treatment. Our well-trained therapist wills most pleasure to explain each steps of treatment could provide your convenience. Doctor on call, Major credit card are accepted : American Express, Visa, Master, JCB, Dinners Club. Nusa Lembongan is situated 12 kilometers East of Bali. The resort is facing Sanur and the well known Gunung Agung volcano ( 3.1000 meters ) and because of its isolated location and limited infrastructure, the Island has been preserved from the growth and progress that has evolved in Bali over the last ten years.The Hindu population of 3.500, divided into 2 villages and is still reliant on sea weed farming and fishing and this is the economic resources of the Island to this day. Here, time has stopped and the Balinese traditions and culture are still the same as they were many years ago. 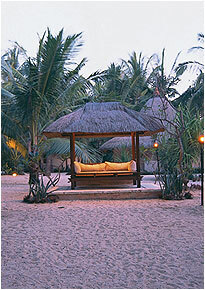 The resort has 5 bungalows with ceiling fan and 5 bungalows with air conditioning. The uncomplicated but uncompromised architecture of polished woods, natural floors, and the distinctive alang-alang roof, transport you in comfort and style to another place, another time. Hair Dryers (OR), Shower, Room amenities/Guest supply (soap, bath foam, shampoo, conditioner, etc), Personal mini bar, Complimentary daily two bottles of mineral water for bathroom use/drinking, Complimentary daily fresh fruit plate, Umbrellas.